What is better than drinking a fine Amarone crafted from the Classico northern hills of Verona? What’s even better is drinking a bottle of the aforementioned wine that was given as gift by a dear friend and wine aficionado! While we at SukasaStyle have often said that life is too short to drink plonk, it is unarguably not long enough to explore the world’s great wines: so many and so little time and limited funds, to boot. 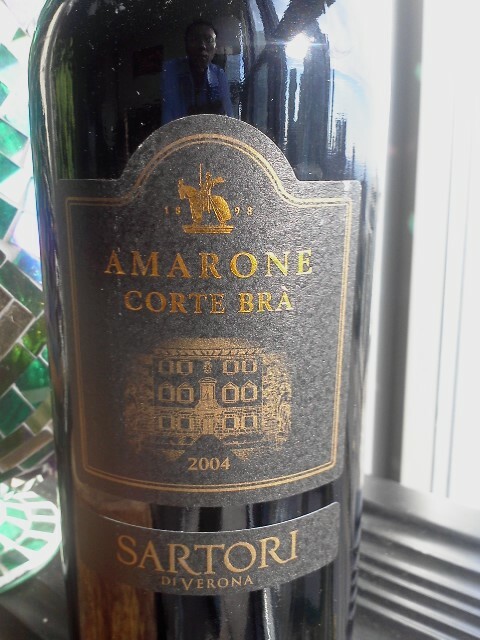 But today’s note has a happy ending for the 2004 Corte Brà Amarone della Valpollicella Classico DOC from Sartori vineyards, comprising 50% Corvina Veronese, 30% Corvinone, 15% Rondinella and 5% Oseleta -- grapes that are dried, parsed and re-selected in typical Amarone fashion -- result in a memorable experience. An important point to consider here: this isn’t your father’s chianti. High even for Amarone, this imbibe weighs in at 15% alcohol and while this punch may initially mask the complexity of the product, it shouldn’t. Give it some time to evolve for with much haste, comes much waste. We found a ruby rich colour worthy of a maharaja’s gems, an almost prune like nose accentuated with a touch of greenery, and an initial taste with a nod to a rich mixture of strawberries, blackberries, rosemary and thyme underscored by crisp acidity and a mouth filling finish. Remember, impressions of wine are as much about the moment as they are about the wine itself: it isn’t about the abstract sterility of simply drinking and recording in a tasting lab. For example, Antonio Galloni, in 2011, weighed in on the 2004 vintage and stated that intrusiveness of the oak on the finish needed to be toned down in future vintages. If that was the case in 2011, it isn’t the case in 2013 – at least to our palate and that of the friends who gifted the bottle -- as your humble SukasaStyle contributor has never been a fan of new World over oaked renderings. Moreover, other reviewers have cautioned about there being “too much ripeness and not enough acidity”. We disagree. The acidity on display here is, of course, beaten by that of a Chianti or reds from cooler regions but there is balance despite the high alcohol content. The alcohol on the nose can be misleading at the start of a meal but a wine of this class is not meant to be chugged but savoured over the span of a few hours, preferably in the company of those you love. Pair with game, stew, lamb, beef or Parmigiano Reggiano, and decent while serving at 18°C - 20°C (approx. 64°F - 68°F). If you are lucky enough to own more than one then cellar for another decade. This wine was part of the March 3, 2012 release at LCBO Vintages, priced at $49.95, so here’s hoping that Woodman Wine and Spirits or another agency brings back future vintages to Ontario.